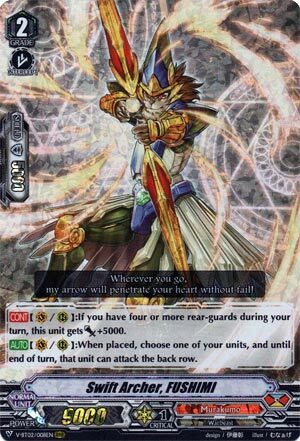 [CONT](VC/RC):If you have four or more rear-guards during your turn, this unit gets [Power]+5000. [AUTO](VC/RC):When placed, choose one of your units, and until end of turn, that unit can attack the back row. A friend of mine at the Sneak peek misread it and thought it gave the unit the ability to attack from the back row. No-one caught it. His win felt hollow in that respect. Not that attacking the back row is bad. it’s an improvement on the old one in that it’s good on RG circle as well. Is it worth trying to snipe a back row though? Certainly there are enough boosters to go around that pressure such as Daitiger, Daibrave and Blaster Dagger and whatever else procs on-boost and on-hit, but those tend to pull a vanishing act after use and requires you guard first just to keep them on the board. Still eats 15k shield with the right set up, so overall shield lost for a booster is relatively worth more. Let’s see if we get Forerunner back, shall we? Otherwise, the power gain to hit Force is worth something at least.